I have two of them around my house, but I've actually never read any of Norman Lebrecht's books. Of the two I have The Maestro Myth looked the more interesting. I'm not sure he's actually making the point he's trying to make. For instance, Gustav Mahler and Arturo Toscanini became the icons they became by rescuing for all time the important cultural institutions, respectively, the Wiener Staatsoper and La Scala Milano. And they each did this single-handedly, without the help of incompetent administrators. So we should hire someone else over them to screw that up? For me it doesn't damage either one of their reputations to know they were pretty weird ducks. I've known a few musicians, and a lot of them are. The fact that they come out dressed in tails doesn't mean they suddenly became normal. The point it seems he is trying to make is that the mythology that surrounds the historical great conductors is just puffery. So what great cultural institution did he rescue? Norman Lebrecht, apparently. I didn't know that it was Mahler who wanted the Leonora Overture in the middle of Fidelio. I'm glad this tradition seems to be dying. 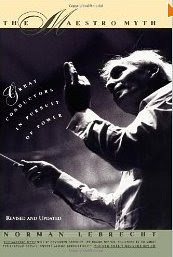 The most shocking thing I've read so far is about Toscanini. I already knew that he threw things around the rehearsal room when things didn't go his way. No. The shocking part was that it turns out there were two reasons why he always conducted from memory--the one about la bella figura where he was too vain to want to be seen wearing glasses we already knew. He preached the gospel of following the composer's wishes, of the one true interpretation--his own, of course--which erases and supersedes all others while secretly rewriting the music whenever it didn't sound the way he wanted it to. He wouldn't dare bring these obviously altered scores into the house where someone might see them. Hmmm. I'm on the other side of this argument. For you there may well be only one true interpretation. But someone else may hear and feel this same music differently. For that person that is the one true interpretation. It is vital to have one, but if you have truly done your work, your performance will sound completely original. Few actually achieve this, but Toscanini was one of those. For the public impossible fanatical standards of ones cultural leaders are an unqualified blessing. It is the imposed identity that creates greatness. Striving for mediocrity is what kills art.